Top Ten Bingo is a name you might associate with the land based bingo clubs, but did you know they also have an online operation? The site is powered by the popular 888/Globalcom software and is just one of the brands that make up the Cashcade network. If you have played at any of the other sites on this network, everything will feel very familiar as they use the standard layout that we have seen numerous time before. This is not necessarily a bad thing as it is well designed and functional, but after a while it does get a bit boring seeing the same site over and over again with just a name change. The homepage is made up of a series of banners that are used to advertise their latest promotion and welcome offers, and the good news is they are static so not annoying in the slightest. Down the left hand side of the screen, you will find a selection of their mini games and these include multi-line slots, scratchcards, Roulette, 3 reel slots and classic instants. Clicking on any of these will take you directly to the lobby, saving you a couple of mouse clicks. The rest of the Top Ten Bingo layout is the same with the exception of ‘Our Clubs’ on the menu at the top of the page. This leads to a handy club selector, just in case you fancy closing down the computer and trying your luck in a club for a change. During the registration process you will be asked all of the usual questions such as your name, address, date of birth and email address. You also have to come up with a username and this will need to be different to any you have used for sites on the same network. You are required to enter your credit card details, but this is for security and verification purposes only and they won’t take any more until you are ready to make a deposit. When this time comes, they offer a number of different payment methods and you will earn a bonus on every deposit you make. Head into the lobby and all signs of Top Ten Bingo vanish. Their red and white colour scheme is substituted for the networks standard blue and even their logo has been replaced with a generic ‘Bingo’. 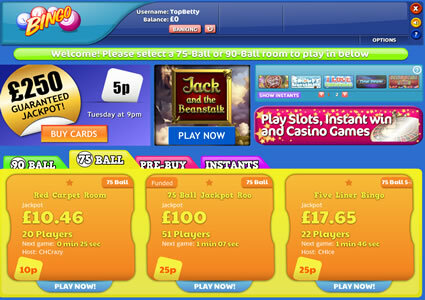 You will find just four tabs which lead you to 90 ball bingo, 75 ball bingo, pre-buy games and instants. There are just seven bingo rooms to choose from, some of which can only be accessed once you have become a funded player. Not all of the rooms are open 24/7 though, so at quieter times you will find everyone congregates in the one place which is actually a good thing as it results in larger prize pots. 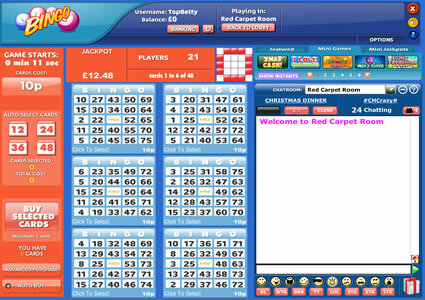 The bingo rooms themselves can’t be faulted as the 888/Globalcom software has been developed over many years and across many sites. It all works perfectly with everything exactly where you would expect it to be. The screen is roughly split down the middle, with the left hand side dedicated to your cards and the right to chatting with your friends. They have included plenty of options so you can customise the look and feel of the place to suit your own preferences and the addition of the mini games in the top right hand corner means there is no chance of you ever being bored. If you play bingo for the chance to win big cash jackpots than you can have a great time at Top Ten Bingo. Every week they give away over £50,000 worth of guaranteed cash jackpots with prizes ranging between £25 and £5,000. If however you agree that variety is the spice of life, you might find that the rest of their line-up is a bit of a let down as there is really not a lot going on. They do offer a Loyalty Programme and a Refer a Friend scheme but lack anything really special to encourage potential players to sign up. With so many other sites out there offering a lot more, this is an area they really need to work on. Top Ten Bingo shares the fate of many online bingo sites out there and that is that do not offer enough to get themselves noticed. With money being so tight for so many people and with so many different brands out there, modern bingo players can afford to be choosy and rightly so. So many of these networked sites rely on the networks basic offerings which in our humble opinion is the lazy option. All it takes experience in the industry? Top Ten Bingo is powered by the 888/Globalcom software, so they are home to 75 ball bingo, 90 ball bingo and a good range of side games including multi-line slots, scratch cards, Roulette, 3 reel slots and instants. All of these games can be accessed from the lobby or from within the bingo rooms and because they open up in a pop up window, you can play them at the same time as your bingo games without one interfering with the other. The side games look great, with plenty of exciting features, all geared towards boosting your chances of winning a jackpot or two. 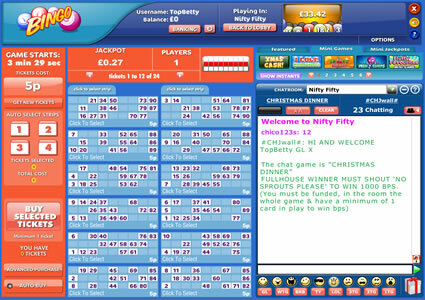 Click on ‘Options’ in the top right had corner of the bingo room and you will find a few basic options allowing you to configure the game play to suit your own tastes. You can choose whether you want to see animations, tool tips, themes and the room introduction or just turn them off altogether. There are some basic chat options and alerts and you can choose from a small selection of dabber colours and shapes. When you register at Top Ten Bingo, you will an earn an impressive bonus on your first deposit, followed by reload bonuses on all future deposits. The free money does not end there though, because if you recommend the site to your friends and they go on to sign up too, you will pick up 5,000 Bingo Points worth £5 for every one that becomes a depositing player. In addition to this, every Sunday they have a tournament and the three players that purchase the most bingo cards will win a share of 50,000 points. 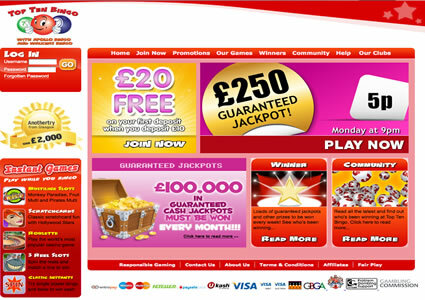 The only other real promotions on the go at Top Ten Bingo are the guaranteed jackpot games detailed below. The Cashcade network really needs to take a look at what they have to offer, as right now they are falling behind the competition by quite some distance. Top Ten Bingo is one of the sites on the Cashcade network, and each week they give away over £50,000 in guaranteed cash jackpots. These prizes range between £25 and £50 and are given away through a schedule packed full of special games that run every fifteen minutes in both their 75 and 90 ball bingo rooms. Head into the lobby though and click on the ‘Pre-Buy’ tab and you will be able to purchase cards for all of Top Ten Bingo’s big money games that run seven nights a week at 9pm. Each one of these games gives you the opportunity to win even larger prize pots.